THE DOMINO THEORY states that if one vital country in a region falls to an expansionist negative philosophy, then other countries in the region similarly situated and similarly structured would fall victim to the same philosophy, either through force or through influence of example. In its pure form, the negative philosophy is communism but in variants it can be socialism or theocratic Islam, The theory was used as a rationale for American interventions, including most disastrously the intervention in the Vietnam War. After World War II, the geopolitical situation of an already shaky alliance between the Western capitalist democracies and the communist Union of Soviet Socialist Republics fell apart as the Soviets sought to establish a buffer zone of satellite states and the UNITED STATES asserted the rights of all nations to independence in a postcolonial world. Each side accused the other of starting the Cold War, and the world quickly polarized as each camp took an “either against us or with us” attitude and enforced it through alliances, such as the Soviet bloc Warsaw Pact and the U.S.-led NORTH ATLANTIC TREATY ORGANIZATION (NATO). Battling monoliths faced each other across the Iron Curtain in a Cold War where none was allowed to be neutral. The West definitely feared communism, as it had since the Russian Revolution had generated Red Berlin and America’s red scare back in the aftermath of World War I. The communists had been active in the intervening years, notably in SPAIN, and there were examples where briefly democratic countries became communist as the map of Europe turned “red” after World War II. The U.S. consensus was that all communist movements were part of the communist international, puppets of the Kremlin. Communism was a monolith, not a an idea, like democracy, that might arise in a nation independently of either the United States or the Soviet Union. Because the Soviets had managed to acquire territorial control in East GERMANY, POLAND, CZECHOSLOVAKIA, ROMANIA, and BULGARIA and because communists were in power in Yugoslavia and CHINA, the United States perceived the other side as a monolith united into a single bullet aimed at the Western heart. RUSSIA had been toppling dominoes from the first day after the gunfire of World War II stopped. The only alternative was to contain communism where it existed and keep it from entering any other territory, be it free or nonaligned (a shaky category of potential candidates for coming under the American umbrella). Presidents Harry Truman and Dwight Eisenhower both subscribed to the idea that the only way to confront Russia was to keep it penned where it was. The successful prevention of the Greek domino’s fall was validation. In 1947, GREECE was at risk, with communists in position to take another country into the opposing camp. American involvement halted the collapse, saving Greece for the West. That was containment. According to the theorists, containment of communism outside of Greece kept neighboring TURKEY from falling into the Soviet sphere. Had Turkey fallen, then the Soviets would be able to influence the MIDDLE EAST, with Asia next. A corollary to containment was the domino theory. Liberal and conservative alike in an age of consensus about the evils of communism subscribed to the domino theory. They agreed that if the communists ever managed to take one country, then that country’s neighbors would fall one by one until none was left to the free world. This communist imperialism was what President Eisenhower referred to in April 1954 when discussing Indochina and the domino theory. In response to a question from Robert Richards from Copley Press about the strategic importance of Indochina to the free world, Eisenhower replied that the region had a significant value as producer of raw materials the free world needed—tin, tungsten, and rubber. Also, it was undesirable to have another population fall under a dictatorship after the loss of 450 million already. Most important, there was the “falling domino” principle. Set a row of dominoes up properly, touch the first one, and watch them fall one by one until none is left standing. Even the last one is toppled. Lose Indochina, and next would be Burma, THAILAND, the Malay Peninsula, and INDONESIA. Eisenhower further explained that these losses would alter the defensive geography of the region. Not only would JAPAN, TAIWAN, and the PHILIPPINES be vulnerable, but so would AUSTRALIA and NEW ZEALAND. It would also put pressure on Japan, having lost its commercial sphere, to turn toward the newly communized countries. The domino theory was the rationale for U.S. support for colonialist FRANCE and later dictatorial governments of South VIETNAM in Indochina against what it read as a communist insurgency compounded by a communist invasion. In a 1963 press conference, President John Kennedy expanded the domino theory to LAOS. He explained that Laos, a country of 2 million, was a sovereign state whose people desired to be independent. It also had a strategically vital border on the MEKONG RIVER. If it were to go communist, it would imperil the northern frontier of Thailand, would increase pressure on CAMBODIA, and would increase pressure on Vietnam, which would increase pressure on Malaya. The other side understood the domino theory and would possibly seek to take advantage of the vulnerable dominoes one after the other. It was vital to uphold the Geneva Accords, to protect the dominoes to preserve the stability of Southeast Asia. The theory acquired critics over time, but it remained the majority view as the United States entered deeper and deeper into the war in Indochina: Vietnam, Laos, Cambodia. From Eisenhower’s blocking of the elections in Vietnam when he expected the communists to win, to Kennedy’s sending of “advisors,” to Johnson’s escalation until well over half a million American troops were fighting to save the South Vietnamese domino, to Richard Nixon’s secret plan for peace, the domino theory kept the U.S. in Vietnam. For more than a decade the dominoes held. Then the United States retreated, leaving Vietnam to solve its problems alone. The south went communist. After the Democratic Republic of Vietnam came into being as the unified successor to the divided country, in 1975 Laos and Cambodia also became communist. This apparent falling of dominoes to the communists validated the theory for some. 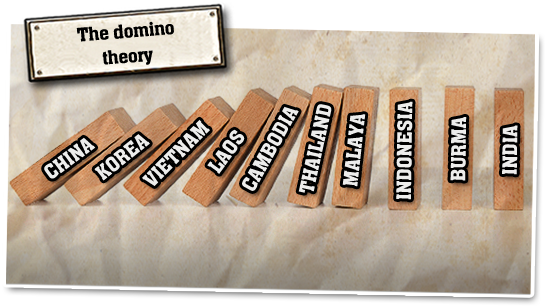 Those who denied the legitimacy of the domino theory argued that the examples were not valid, because North Vietnam had long dominated Laos and that the “domino” had already fallen. In Cambodia the Khmer Rouge regarded Vietnam as an enemy. Although they shared a loose philosophical tie, there was no monolithic communism there. If anything, there was a potential fracture in the monolith, a counterforce to the dominant communist power, as China and Yugoslavia had been for the Soviet Union. President Richard Nixon’s perspective was that the most compelling argument for the theory was that the dominoes had faith in it. It’s true that countries bordering communist ones did fear subversion. That was one of the justifications for the treaty system: mutual protection of the potentially endangered dominoes. A variant on the domino theory espoused by Noam Chomsky is that the capitalists feared a successful unaligned socialist state because it would provide an example of an alternative path to the communist or capitalist ones. It would cause others to fall like dominoes into the socialist neutralist pattern. Chomsky cites this fear as the primary reason that the United States intervenes in politically and strategically insignificant parts of the world such as GUATEMALA, ANGOLA, and EAST TIMOR. The counter to this theory is that it fails to fully account for Soviet influence in the third world. Although few of the original supporters of the theory still subscribe to it, some still justify military activism using the domino theory. Rather than communism, in the post-Cold War world, the threat is Islamic theocracy and the counterweight is liberal democracy in the Middle East. The theory applied during the Iran-Iraq War as a rationale for taking the side of IRAQ in order to prevent IRAN from spreading its radical theocracy in the Middle East. The neoconservative rationale for invading Iraq in 2003 was that toppling Saddam Hussein would create a model liberal democracy that would spread the same system through a tumbling of repressive autocratic regimes from Iran to SAUDI ARABIA, perhaps throughout the Muslim world. And there remain those who believe that the Vietnam War validated the theory. According to this logic, the countries of the Association of Southeast Asian Nations (Philippines, Indonesia, MALAYSIA, SINGAPORE, and Thailand) were free because the United States gave them the example that it would support regimes that resisted communism. The Indonesians evicted the Soviets in 1966 because the United States was fighting for freedom, theirs included, in Vietnam. That resistance halted an inevitable advance of communism to the Malacca Straits and Singapore. Another domino theory deals with the postwar spread of democracies. In the late 1990s there were 179 democracies of 192 sovereign states, 93 percent of the world’s governments. Sixty-nine nations had their first-ever elections in that decade. Three of the five newest democracies were former Soviet republics (BELARUS, ARMENIA, and KYRGYZSTAN), all of which had national elections in 1995. In Africa, TANZANIA and GUINEA joined the roster of new democratic countries the same year.